Darrell is a retired senior naval officer with over 23 years experience in oceanography, meteorology and hydrography in support of global military operations. He graduated from the University of Oklahoma with a B.S. in Meteorology in 1976 and a dual M.S. in Meteorology and Oceanography from the Naval Postgraduate School in Monterey CA in 1985. He has held numerous leadership and management positions and has served on several Admirals’ staffs. He served as the Officer in Charge of the Navy’s meteorology and oceanography office in Alameda, CA and the Commanding Officer of Oceanographic Unit Five conducting hydrographic operations off of Somalia. After retiring from the Navy, he was a Regional Business Development, and Program Manager for Battelle Memorial Institute, a not-for-profit research and development institute, supporting the Intelligence Community. Later, he was the first Director of the Electronic Chart Display and Information Systems (ECDIS) Laboratory for the Hydrographic Science Research Center at The University of Southern Mississippi. Darrell spent over four years with the U.S. Department of State as the Director of the New Orleans Passport Agency. 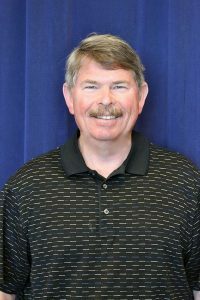 He is presently the Director of Operations at the Naval Oceanographic Office at Stennis Space Center responsible for world-wide oceanographic data collection utilizing ships and aircraft in support of the U.S. Navy. He is also a 1999 graduate of Leadership Slidell. Darrell and his wife Angela reside in Slidell with their three dogs. Darrell enjoys being outdoors and is an avid runner participating in many area fun runs. Appointed by State Representative Scott Simon; exp. January, 2020.